View More In Juicer Parts & Accessories - Page 4. How to keep the fresh and nutrition of fruits or foods? Do you want to drink fresh fruit juice anytime.We believe this mini electric USB juicer cup is your wonderful choice.With the speed of 2,2000 per minute,fruit is smashed and mixed completely in short time, then you can get natural fresh juice.In fact,our portable juice blender cup is a multifunctional mixing machine,not only can make juice, but can make milkshake,DIY smoothie or mask mud.Let's enjoy fresh and health from now! 1. Please charge the juicer cup for 2-3 hours before using. 2. Please clean the cup when you use it firstly,please be careful of the blade. 3. Don't fill the bottle fully,don't over 2/3. 4. The juicer cup will not work when charging. 5. Signal light: when the light is red, which means the blade stuck.If the light turns to red after working for a while, which means the juice mixing machine is out of power. Use Safely: If you don't install the cup into the base correctely, the spin will not work. So you never worry that the blade will damage you. Food Grade Material: The blade in this fruit juice mixer are 304 stailess steel, the cup lid and the fliter is PP material and the cup body is food-garde PC materail. Absolutely safe and healthy for people. Portable Size: The capacity of the juicer cup is 380ml,which is suitable for personal using and convenient to carry anywhere. 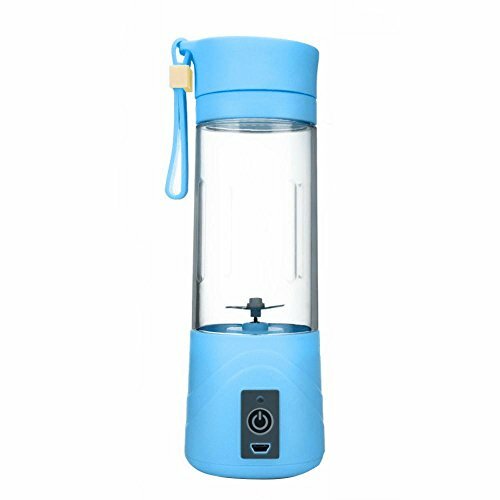 Rechargeable: With an USB charging cable, you can use the mini juicer blender with many kinds of power devices, such as mobile power bank, vehicular charging, usb charging. If you have any questions about this product by Aolvo, contact us by completing and submitting the form below. If you are looking for a specif part number, please include it with your message.